ab30563 recognises EphB1 (phospho Y331). Synthetic Phosphopeptide corresponding to amino acid residues surrounding the phospho Tyr331 of chicken Ephrin B1. Note: Chicken Tyr331 is the homolog of mouse and rat Tyr343, human Tyr344 and also Xenopus Tyr324. Prepared from rabbit serum by affinity purification via sequential chromatography on phosphopeptide and dephosphopeptide affinity columns. Our Abpromise guarantee covers the use of ab30563 in the following tested applications. WB 1/1000. Predicted molecular weight: 46 - 50 kDa. Binds to the receptor tyrosine kinases EPHB1 and EPHA1. Binds to, and induce the collapse of, commissural axons/growth cones in vitro. May play a role in constraining the orientation of longitudinally projecting axons. Defects in EFNB1 are a cause of craniofrontonasal syndrome (CFNS) [MIM:304110]; also known as craniofrontonasal dysplasia (CFND). CFNS is an X-linked inherited syndrome characterized by hypertelorism, coronal synostosis with brachycephaly, downslanting palpebral fissures, clefting of the nasal tip, joint anomalies, longitudinally grooved fingernails and other digital anomalies. Western blot of rat testes lysate showing specific immunolabeling of the ~46 kDa EphrinB1 phosphorylated at Tyr331 (control, lane 1). The phospho-specificity of this labeling is shown in lane 2 (identical blot, except for incubation with lambda-phosphatase (1200 units for 30 min) before exposure to the anti-Tyr331 ephrinB antibody). The immunolabeling is completely eliminated by treatment with lambda-phosphatase. ab30563 has not yet been referenced specifically in any publications. Publishing research using ab30563? Please let us know so that we can cite the reference in this datasheet. Yes, that is correct. Further on, we will inform all the customers who bought from us about this mistake. since the data about the western-MW and the position of P-tyrosine seem to correspond to the Ephrin-B1, rather than to the EphB1 receptor (which should have a MW around 100 and should have not a tyrosine in 331, according to the Swiss prot database). You are absolutely right! 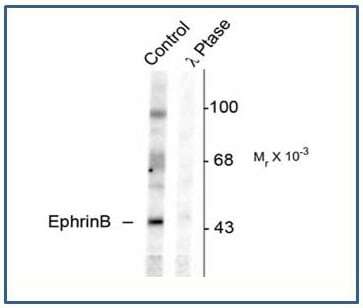 We will unpublish this antibody and correct the name to Anti-EphB1 (phospho Y331). Further on, we will inform our customers about this mistake.